Some of the special waters and washes, such as War Water and Four Thieves Vinegar, are for throwing on an enemy's door step or fixing up in bottle spells, while others, like Peace Water, Willow Water, and Chinese Wash, are used in rites of sprinkling, spraying, bathing, or foot-washing, for spiritual purification. Chinese Wash and Ammonia have long been the favourite product for scrubbing the door step to keep away evil. Use 1-3 tablespoonfuls in a bucket of water. 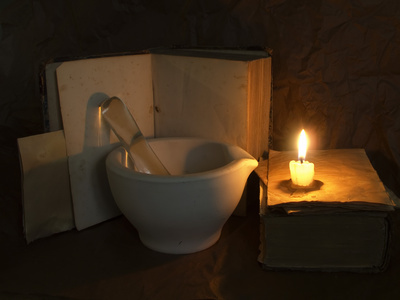 Scrub the floors on your hands and knees if you are physically able, and pray or recite Psalms as you clean. A ritual floor washing should always start at the back of the premises and end at the front door step. That crucial area is usually given an extra-thorough scrubbing and it may also be swept while wet with Chinese Wash if the intent is to keep away evil visitors. 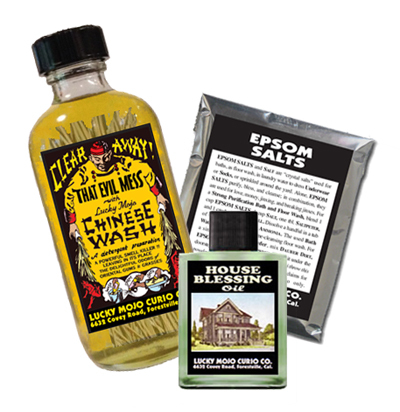 For removing evil, home purification, and unjinxing; a household cleaner; a few drops may be added to uncrossing baths; has a great old-time label.4 oz. glass bottle. 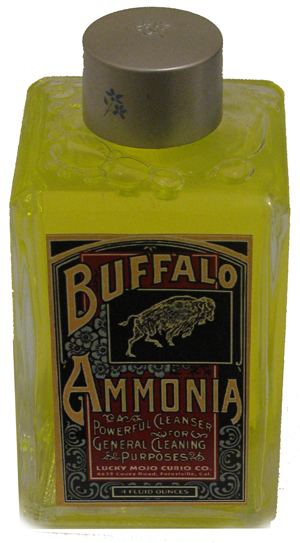 • See All Buffalo Ammonia, 4 oz. Spiritual Supplies For Sale at the Lucky Mojo Curio Co.
Herbal floor wash for clearing away evil, home purification, and unjinxing. Use it all around the house as your everyday cleaning product. 4 oz. glass bottle. • See All Chinese Wash, 4 oz. Spiritual Supplies For Sale at the Lucky Mojo Curio Co.
Used for personal protection, to ward off diseases both natural and unnatural, get rid of enemies, to foment dissent. 4 oz. glass bottle. • See All Four Thieves Vinegar, 4 oz. Spiritual Supplies For Sale at the Lucky Mojo Curio Co.
Orange essential oil in pure distilled water (not alcohol-based); this lightly scented water is used to wash the body of those seeking luck or marriage, in Middle Eastern cookery, and as an altar offering during invocations to the deities of Luck and Marriage. 4 oz. glass bottle. 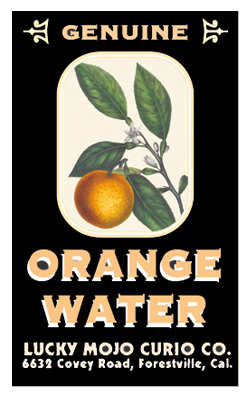 • See All Orange Water, 4 oz. Spiritual Supplies For Sale at the Lucky Mojo Curio Co. Sprinkled in the corners of the home or in a place of business to ensure that only kind people and good spirits enter. 4 oz. glass bottle. 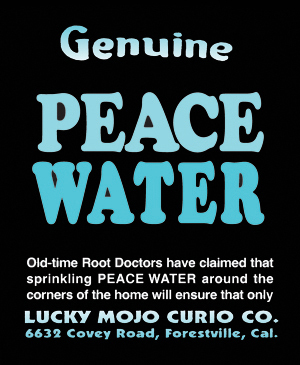 • See All Peace Water, 4 oz. Spiritual Supplies For Sale at the Lucky Mojo Curio Co.
Rose fragrance pure distilled water (not alcohol-based); this lightly scented water is used to wash the bodies of those who seek love, in Middle Eastern cookery, and as an altar offering during invocations to the goddess of Love. 4 oz. glass bottle. 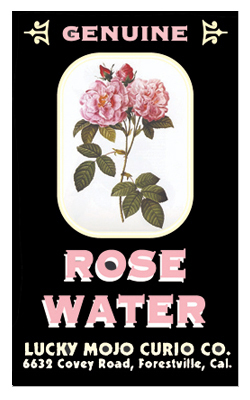 • See All Rose Water, 4 oz. Spiritual Supplies For Sale at the Lucky Mojo Curio Co.
9 drops of any of these Protectively Cleansing DRESSING OILS (choose one from this list): Cast Off Evil Oil, Fiery Wall of Protection Oil, Hindu Grass Oil, Jinx Killer Oil, Protection Oil, Uncrossing Oil, House Blessing Oil, Run Devil Run Oil, or Van Van Oil. 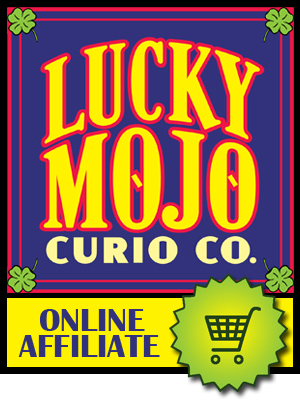 • See All Floor Wash Special (Chi Wash, Min Salt, Cleansing Oil) Spiritual Supplies For Sale at the Lucky Mojo Curio Co.
Used for enemy tricks, to declare occult war, and to trouble someone; traditionally broken in the enemy's yard or on the doorstep. 4 oz. glass bottle. • See All War Water, 4 oz. Spiritual Supplies For Sale at the Lucky Mojo Curio Co.
Willow extract in pure distilled water (not alcohol-based); this lightly scented water is used to wash the head of those with headaches, for bathing aches and pains, and as an altar offering during invocations to the Lunar and Water goddess. 4 oz. glass bottle. 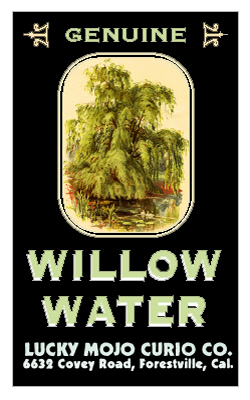 • See All Willow Water, 4 oz. Spiritual Supplies For Sale at the Lucky Mojo Curio Co.